I have found it really useful on several occasions to create ghosts. Does it work with Ds4 or DS4.5? Thanks, I will try to get that when I can. 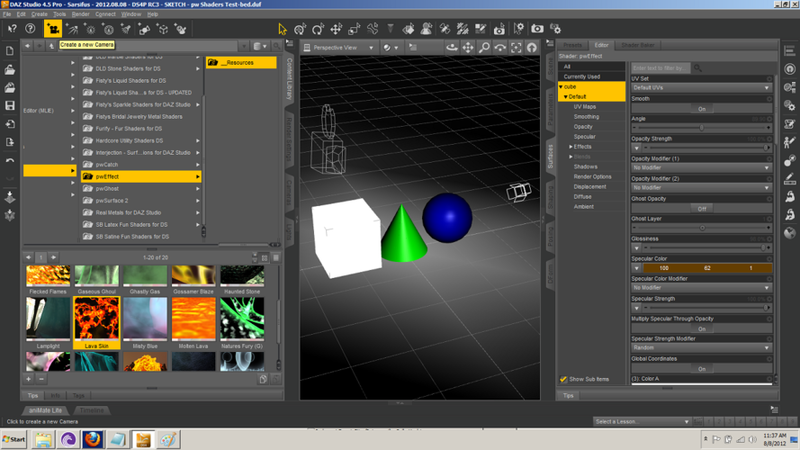 The shaders come with their own help directly accessible from the library where the shaders are. I found them very frustrating to work with. Some of the effects look good straight off, but trying to tweak them to get exactly what I wanted was too much trial and error that I didn't have time to do. The lack of visual clues as you change parameters makes it hard to work intuitively. I hope to get round to looking at it in a bit more depth at some point. Thank you, but those are the exact same documents on the Poseworks' website. Try this, instead: Reality works with DAZ Studio 4, but NOT DAZ Studio 4 RC2 (and presumably RC3) -- as I understand it, Pret-a-3D is waiting for Studio to get nailed down solid before he updates the plug-in to work with it again. Might this not be the same problem I'm having with with the Poseworks' shaders? I'm using DS4P RC3, and even though they were updated for DS4, is it possible they don't work with the later releases and no one has said anything about it yet? Sarsifus, what have you got your light settings set to? I can't remember which way it is, but I think it doesn't work if you have it set to raytrace shadows or something like that - could that be the problem? edit: - ah, it was the render settings I was thinking of. You have to use 3delight render setting or it doesn't work. What I find the pw shaders to be doing is that, upon application, they inject all the extra channels for their given effects and also change the diffuse/ambient/specular/etc. colors. 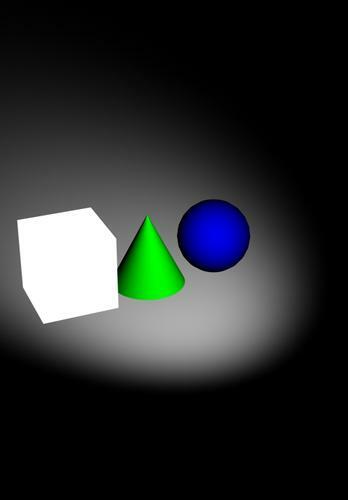 What one shader will create as pure white, another will create in a shade of green, and still another in a shade of blue. However, I still cannot get them to render their intended effects, either by applying one of their presets or by twiddling with the dials. They appear to work normally for me on DS4 RC3, Win32. I have to admit the sheer amount of sliders has always intimidated me, so I only experimented when I first bought them, a few years ago. The presets do render very similar to their respective thumbnails for me (except perhaps Ashen Mountain). If you're twiddling dials try not to overdo the Strengths, try to keep their sums to around 100%, and/or avoid too many lights. No, I've been testing them in a very simple setup: just a plane with a cube, a sphere, and a cone primitives, with a single spotlight. When you apply a preset, should it be apparent in the preview window, or is it only noticeable after rendering? 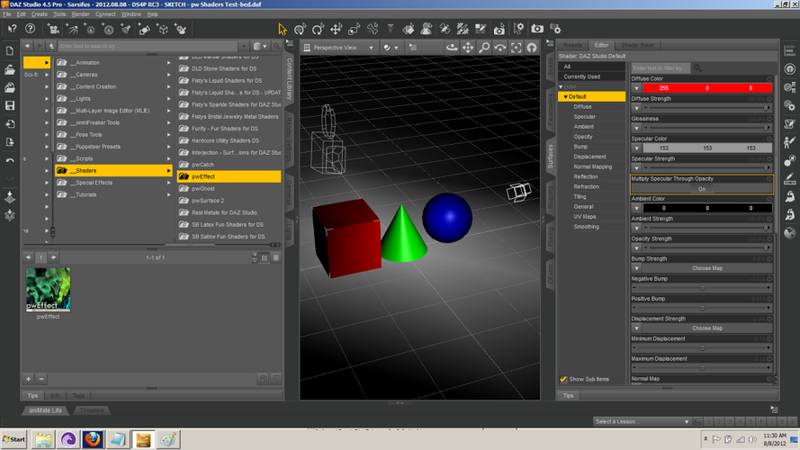 For example, on my machine, selecting the cube and then clicking on the pwEffect shader will add all of the other channels to the cube's properties list in the Surfaces tab, but doesn't visibly change the appearance of the cube. In the second image, I've selected the "lava skin" preset, and you can see that the cube has turned to pure white (you can also see that the specular color has changed to a brownish color more appropriate to lava), but it will render out as pure white, not as a lava cube. BTW: I know about holding down the CTRL key (in Windows) when using Omnifreaker's tools, and then selecting between "Replace" or "Ignore", and this would seem to be similar, but neither option makes any difference with the pw shaders. The extra channels all seem to start out set to "None" or "No Modifiers", which I thought was part of the problem, but even manually setting them makes no difference. The only other difference I can see is that I'm running the 64-bit version of DS4P RC3, and you're using the 32-bit. When you apply a preset, is it apparent in the preview window, or is it only noticeable after rendering? . . . I've selected the "lava skin" preset, and you can see that the cube has turned to pure white (you can also see that the specular color has changed to a brownish color more appropriate to lava), and it will render out as pure white, not as a lava cube. From what I recall (it's been a while since I've used these), the effects only show in the completed renders, not in the preview window. Render your lava-skin test and see what that gets you. Huh! I can imagine. :shut: Okay, I've got nothing, sorry. That's cool. Thanks for the help, and thanks to everyone who's helped with this. Thank you, I tried that. I went through and changed every single color channel to black -- and then the object rendered out to a neutral grey. What it looks like is happening, is that when I apply pwEffect, the pure white is the ambient channel being set to white at 100%. When I cranked it back down, the object was simply neutral grey, even with all of the other channels set to black. I just don't think the 64-bit pw shaders are working with DS4P RC3 64-bit. Oh good point, Ambient in pwEffect acts as minimum colour of a surface, which is different from what DS uses (DS is the odd one out in that regard). You really have to dial it back a lot if you are used to the DAZ default material. I tried applying the shader to Genesis' torso, without applying any preset, and setting the Diffuse, Ambient and Specular colours to black yielded what looks to me like a black torso. So in your render, does that count as a success or a failure of pwEffect? Haven't used much, but a very handy tool to have at your fingertips. Yeah, the effects look great -- that's why I finally bought them a month or so ago. I've been beating my head on my keyboard, trying to figure out what it is I'm doing wrong, and then it hit me that even though they've been updated, they probably don't work with the RC3 version of DS, much like Reality isn't working right now. I've submitted a bug report with some test renders and a copy of the log file, so maybe I can get some help with that. Just tried myself and pwEffect is working in 4.5 RC3 here (not ordered in bundle, but as single product). Do you got the latest version? As they got updated for the RC3 build according to the RC3 announcement as well. 10. We would suggest that in order to use the PW Shaders you should reset your downloads to get the latest version to run with DAZ Studio 4.5 RC3. To add: My download is "5387_pwEffect_1.2_ds.zip". Yes, it does, especially in light that the presets worked for me. Wasn't anything I did -- simply a matter of having installers that work. I figured it was an incompatibility with the RC3 release and not something I was doing wrong, and it's a relief to know I wasn't making a mistake somewhere. Now I can try all the ideas I've been working on. :) Thank you to everyone who helped with this.